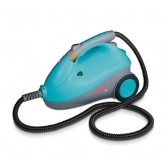 Steam Cleaner removes very tough stains. It is often used to clean bathroom and kitchen areas. It has a attachtment for scrubbing and the cleaning of windows.